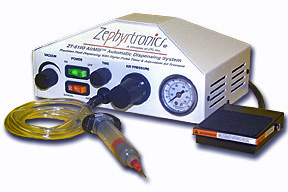 Zephyrtronics Equipment is Designed, Engineered, and Manufactured in the United States of America. The "early days" of the company as David Jacks & Randy Walston lay ground work, engineer, R&D, test & evaluate & apply for patents on their new, milestone low temp approach to benchtop soldering & rework. The Company introduces world’s first stand-alone, bottom-side preheating system, The AirBath™. 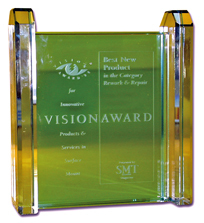 Zephyrtronics awarded the "Vision Award" for Best New Product of the Year at the San Jose Convention Center in Silicon Valley. Motorola certifies the Zephyrtronics equipment and methodology after extensive laboratory testing and evaluation for the Famous Iridium Project. Hughes Aerospace orders 100 AirBaths™ for its high end production facilities. SMT Magazine's editorial staff calls Zephyrtronics one of the three most innovative companies that year. 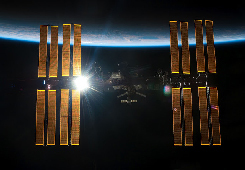 Boeing Purchases Hundreds of Zephyrtronics AirBaths for the Int'l Space Station Project (ISS). U.S. Department of Defense selects Zephyrtronics as approved supplier. SMD removal. Zephyrtronics aggressively litigates against a competitor for patent infringement and is successful. Competitor settles out of court. BGA rework. Zephyrtronics defends copyright infringement by competitor who settles for unauthorized commercial use of technical writings. 3-year string as fastest growing soldering equipment manufacturer on earth. Also: Introduction of dispensing product line. In Six Sigma Study, Major Aerospace Company Reports Changing to Zephyrtronics Would Prevent Up to $1 Million Rework Scrap Per Year Compared To Using A Competitor's Products. Our ZT-7-MIL is selected by The J.P.L. Mars Rover Project for BGA tasks. After smashing success of the Mars Rovers, NASA issues 39-page touting Zephyrtronics for making "mounting & removal of thru-hole and SMT/BGA easier than routine bench methods"
Introduction of ZeroLead® branded lead-free solder paste and ZeroLead® LowMelt® DeSolder Wire. both are RoHS Compliant. e-commerce site for the convenience of our global customers. Zephyrtronics Expands Its International Distribution With New Partners & Agents in Europe, Asia, Africa, South America, Australia and Middle East. In the midst of global recession, Zephyrtronics increases, yet again, its manufacturing operations, capacity and expands its factory space by over 50% in Los Angeles, thereby keeping its "Made in the USA" commitment for all Zephyrtronics equipment. Zephyrtronics introduces its new highly active pre-fluxed solder wick and a fluxless solder wick for PCB de-soldering tasks. Zephyrtronics Dependable, Original Equipment Tapped by U.S. Military for Anti-Terrorism Fight Worldwide Zephyrtronics Original Equipment Also Tapped by Federal, State & Local Law Enforcement for Critical Crime Solving Electronic Forensics. The Small Engineering Company That Changed the Printed Circuit Board Assembly Workbench Forever! Zephyrtronics is a wholly-owned division and the flagship brand of Jacks' Technologies & Industries Corporation in Southern California. 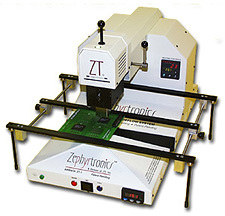 Zephyrtronics manufactures and globally markets its technology leading products targeted primarily for the electronic benchtop where soldering of printed circuit boards (PCB's) is performed. Branded, and Marketed by Zephyrtronics. 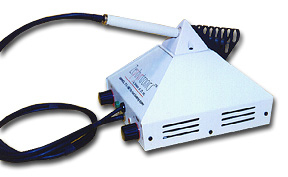 In the early 1990's, Zephyrtronics catapulted to its leadership role in benchtop soldering with rapid-fire introduction of its innovative, award-winning and patented products. Zephyrtronics, for the first time, blended the disparate disciplines of electronics, metallurgy, thermodynamics, and chemistry with an uncanny ease -- delighting its expanding customer base. Twenty years later, those paradigm-shifting PCB processes first introduced by Zephyrtronics have long become "industry standards" from Bangor, Maine to Beijing, China. Zephyrtronics AirBath™ Invention Awarded 'Best New Product'. A source of great pride for the company is that our original equipment and products have played key roles in the production of the International Space Station and the three highly successful Mars Rovers and have been touted by NASA. Over the years, both NASA and the Department of Defense have required their sub-contractors to purchase Zephyrtronics equipment before awarding them contracts. From scientists at atomic accelerators to engineers and technicians in aerospace, the Zephyrtronics brand is top drawer. What a Customer Base! Today, Zephyrtronics products are shipped daily to our customers all over the world from our state of the art factory in Los Angeles, California. Cross-Industry Applications: From such academic notables as Harvard and Stanford Universities to the prestigious national laboratories of JPL, NASA, Fermi, Sandia and Lawrence-Livermore; from leaders in the semiconductor industry as Xilinx, Intel, and National Semiconductor to the world class aerospace facilities of Hughes, Raytheon, Northrop-Grumman, Lockheed-Martin and Boeing; from such commercial giants as Sony, Xerox, Hewlett-Packard, Panasonic and Phillips to even the U.S. Armed Forces...the science of Zephyrtronics became status quo at electronic benches transcending a dream of two mission-driven Californian engineers into an American success story. And transforming how printed circuit board assemblies are designed and made. A Radical Concept! Identifying fundamental errors in the approach to benchtop soldering processes by older equipment manufacturers, the two founders of Zephyrtronics, David Jacks and Randy Walston, developed the world's first truly comprehensive approach to PCB benchtops. Jacks took to the road, traveling around the globe with a slide show pointing to a troublesome double standard of how PCB's were made with painstaking quality in high volume production versus how PCB's were processed, soldered or reworked on benches. And he singlehandedly introduced thermal profiling to the electronic bench -- a concept first met with resistance. With chip miniaturization, multi-layer substrates and flexible circuits, the traditional high temp soldering tool methodology caused serious quality, reliability (costly) problems. Benchtop Synergy! Developing and packaging new equipment, solder alloys and custom chemicals all complimentary to each other, Zephyrtronics crossed over and into traditionally defined "markets" to directly reach out to electronic technicians. And that "cross over" stirred up quite a hornet's nest! Word of mouth between engineers and technicians of this new benchtop "science" spread quickly and demand exceeded the company's initial production capacity. Brand loyalty to Zephyrtronics was something to behold. Zephyrtronics consistently drew the largest crowds at normally staid electronic expositions. Manufacturing and quality engineers -- hardly folks given to euphoria -- were tossing their business cards through the mobs requesting Zephyrtronics to visit their facilities. 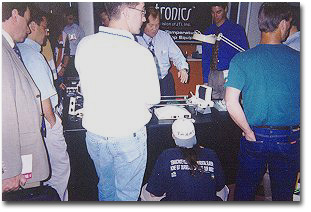 The editorial staff of the electronic devices trade journal, SMT Magazine witnessed the fever Zephyrtronics products were causing and singled out the young company as one of the "three most innovative" in 1997 declaring Zephyrtronics produced a "simpler, safer way to remove and repair sensitive devices." 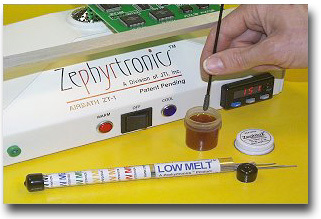 First at the Benchtop: Whether it was PCB thermal profiling, ramping, preheating, post-cooling™, patented single-spot BGA alignment and reflow, successful use of solder paste at the bench, or non-contact desoldering, Zephyrtronics was first at the bench to do so. So Far Ahead of the Curve: Two decades later, every significant soldering equipment manufacturer on earth has been influenced by and (if possible without patent infringement) have acknowledged they incorporated Zephyrtronics' original concepts into their own products. Of course, this forced them to obsolete entire product lines they had marketed for years to "keep up" with Zephyrtronics. And so it is still today where students of physics and electronics in university labs are employing the equipment, alloys, processes and PCB techniques pioneered by Zephyrtronics. Our Customers Matter Most. When it comes to our customers, Zephyrtronics is old fashioned, which means they matter. 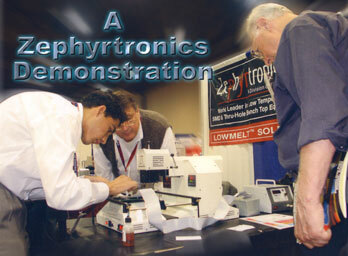 Zephyrtronics equipment has the longest warranties in our industry. We still have original customers from twenty years ago with us and we hear over and again how their original Zephyrtronics equipment is still working after all these years. Very few, if any, within the soldering industry can say that today. That customer loyalty is at the very foundation of our company. "I have to laugh at it all now because, in hindsight, I can tell you that we never gave it a second thought," commented Jacks, president of Zephyrtronics. "Fortunately, we were just naive and foolhardy enough way back then to believe that technicians and engineers would respond favorably if we gave them better tools and solutions. And they did far more than we ever imagined. 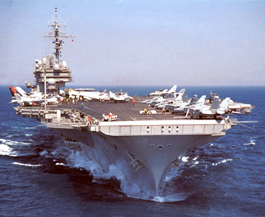 I never dreamed one day I'd have the honor to stand on the USS Kitty Hawk flight deck knowing Zephyrtronics gear was used below." Jacks continues, "Our opportunity was that key manufacturers of benchtop soldering equipment were just so satisfied, set in their ways, resisting change and unaware of emerging technologies. Complacency gave us an opening to change things in a big way. "The old giant soldering companies had no clue how irrelevant their products had become to current chip technologies and how their approach to the bench was simply Jurassic...and then they began copying us." Recognizing the reality that the benchtop market, like others, is not only highly competitive, but also imitative, Jacks and Walston remain nonplussed. Walston wryly adds, "I guess I should feel somewhat guilty knowing we inspired so many lousy imitations and how they can confuse the market a bit, and worse, frustrate poor technicians who get stuck using them." Still, engineers and techs continue to specifically seek out the Zephyrtronics brand as they have in the past. Indeed, some of the most prestigious names in the electronic manufacturing industry schedule their budgets around upcoming products that Zephyrtronics has only shown at trade shows and yet to release. Jacks grins, "naturally, all of this drives our competition absolutely nuts with envy." The Zephyrtronics ZT-7 Chosen By NASA & JPL for the Successful Mars Rover Program. NASA Issued 39-Page Report Touting the System. With detailed milestone charts for a host of future new product introductions, Zephyrtronics still remains dedicated to the same principles that fueled the company's impressive and rapid growth from the early days: simplicity through innovation, fanatical commitment to quality and premium products at affordable prices. And adds Jacks, "we give the highest respect possible for our customers. Even after all these years of success, we are mindful that we are still just that little soldering and preheating company from Los Angeles. But did I tell you we forever changed and improved the way PC boards are made in labs and production facilities around the planet?" ©1996 - 2011, 2012, 2013, 2014, 2015, 2016, 2017-2018, 2019 by Zephyrtronics®. All rights reserved. The information, text, images, photographs, charts, graphs you receive online from Zephyrtronics® are protected by the copyright laws of the United States. The copyright laws prohibit any copying, redistributing, retransmitting, or repurposing of any copyright-protected material. Zephyrtronics is the registered trademark property of JTI, Inc. "The Science of Zephyrtronics" and "Simplicity Through Innovation" and "Zephlux" and "ZeroLead" and "Zero Balling" and "Zero Residue" and "Post Cooling" and "Post Cooler" and "AirBath" and "SolderGlide" and "ZeroTouch" and "SolderMill" and "Just So Superior" are the protected trademark property of JTI, Inc. "Zephyrtronics" and "Low Melt" and "Air Fountain" and "Fountainhead" are the registered trademark properties of JTI Inc. *The above names are the registered property of their respective owners.